It begins with an accident, an injury, and someone to blame. I fell asleep at the wheel, causing my youngest child’s C6-7 spinal cord injury. As a life-long advocate of people with disabilities—even before the accident—I lose myself in guilt and depression. My shy but determined teenager battles the limits of quadriplegia and carries us forward, since, between the two of us, she is the emotionally stable one. I attempt to keep up as her world resonates with fortunate accidents. Let other people help. Get comfortable asking for help until you are back to being the one who can give instead of receiving. Then I had to stop writing. I realized that I had been told these things, in one way or another. Thankfully, family and friends had rallied to support us. Even so, I didn’t sleep during the first days and was unable to talk about my feelings. I also could not ask for help. I had to rethink my list. I started over with things I had not heard soon after the accident. 1.Find the best medical options. 2. Seek support right away. Believe what the top doctors and physical therapists tell you. 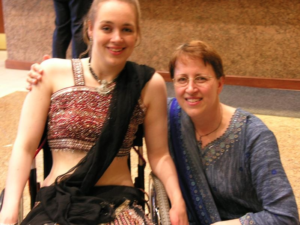 Through the first weeks after the accident when Beth could not move, I thought that the experts were giving her false hope about things like sitting up unassisted. I wanted to believe them, but I didn’t understand that progress after a C6-7 spinal cord injury takes a sustained effort over an incredibly long time. 4. Don’t lose yourself in fear. The first year after the accident, I worried endlessly about the health risks of quadriplegia, ready to drive to the emergency room at any moment. As Beth did everything she could to be healthy, she showed me that I didn’t need to be afraid. Professional counseling helped me, too. 5. Look for hope, even when it is out of sight. In the beginning, too much time passed before I truly believed that Beth would be OK. She believed it from the start, and hope is a powerful thing. I could not imagine her becoming independent, or traveling the world, or loving her life. I’m happy that I was wrong. Thank you, Brian! Best wishes! If you want to see an aardvark in summer, go on a night drive at Mokala National Park near Kimberley. I ha8;2#d&17nt intended to do the night drive, but when I saw the surfeit of anthills, I decided now was my best chance. After about 20 years of eluding me in the wild, BINGO, there he was! Magic. As a person with a SCI I needed to give the average joe on the street more credit. People are curious and will speculate as to what happened and how difficult life must be. It is my job to make people at ease and educate at the same time. There are more good people than bad. Hi Matt. I agree! The more we can educate people about disability, the less we will see negative stereotypes. This is such important material to share, Cindy. It resonates with many situations. Thank you for the courage and honesty of this blog. Thank you, Sandy! As you know, it took me awhile, but I eventually found my voice. I hope that my writings will someone in a difficult situation, in some way.